Oh happy day. We’re here to share all of our bathroom after pictures complete with a full timeline and a budget breakdown to detail every step of this month-long weekend and evening project of ours. Now look at the same room all put back together again. We’re thrilled that everything seemed to click into place in the home stretch, and now our bathroom is honestly one of our favorite rooms in the house. Weird, but true. You can see that we hung a dark wood mirror (which we scored for $27 on clearance at Target) above the similarly toned vanity. We love that it also picks up the rich mocha color in our discount marble flooring (which you may remember we snagged for around $2.50/square foot at Lowe’s on clearance). You’ll also notice some art on the wall… and you know we weren’t about to pay for something when we could make it ourselves, right? John actually came up with the idea of creating vintage-looking wood signs (he’s the brains of this operation, I’m telling you) after I lamented that the thought of square frames next to the rounded mirror could look a bit chaotic. So we picked up one $6 piece of wood, had it cut into two equal pieces right there in the wood cutting area of Home Depot and took them home to transform them into something worthy of our brandy new bathroom. We took inspiration from our time spent in NYC (where we met and fell in love) so we thought making signs that mimicked the look of old NYC subway signs (like these that we hunted down on google) would be a special way to add more of that customized feeling that we love in our home. Of course we adapted ours to be a bit less dark to complement all the white in our bathroom (and in our house for that matter). We also picked two subway stops with the most meaning to us (we met working together near Grand Central and both lived in Astoria Queens at different times). After bringing home our pre-cut planks of wood it was as easy as painting them white with craft paint that we already owned (it was thinner than latex wall paint so some of the wood grain still showed through) and designing two “signs” in Photoshop (we printed them out ourselves for free). 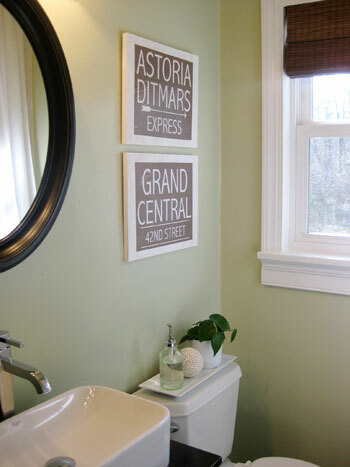 Then we roughed up our prints for a weathered, creased, and vintage look and Mod Podge came in handy when it came to attaching them to the wood planks (the waterproof protection it added was also a plus since they live in a bathroom). Note: we’ll be doing a follow up post with more step-by-step sign making details for anyone who wants to take on this project themselves so stay tuned. But on with the bathroom tour! If you look at the photo above, you’ll see that we actually opted to attach a simple chrome toiler paper dispenser to the side of the vanity since we didn’t want it attracting attention from the hall (which it would do if we placed it on the other side of the toilet under the window). We also picked up a simple white ceramic tray for the top of the toilet (we actually cut a thin strip off of one of our rubber rug-pads to form sort of a grippy buffer between the toilet and the tray to keep it “stuck” in place for the long haul). Then we used the tray to corral our favorite soap pump (which we waxed poetic about here) along with a cute little shell ball and a leafy green plant. Although there was room for a soap dispenser on the back corner of the vanity behind the sink we thought it looked cuter a few inches to the right on top of the toilet- so while we know other people might want their soap pump right on the top of the vanity, we personally liked it on the tray (to each his own, right!). It really keeps the top of the sink uncluttered and sleek looking, and we always have the option to simply move the pump over to the sink if weeks of use make us rethink our nearby toilet-top placement. 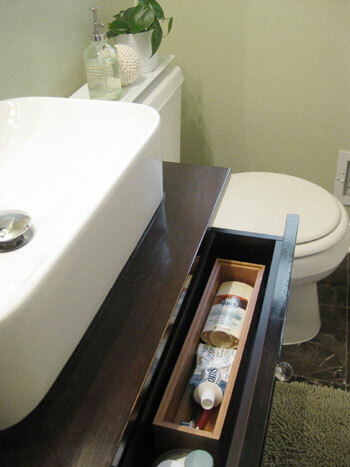 We also love that we were able to save the vanity’s drawer by shortening it (read more about the process of building the vanity here) so we can still fit a few staples in there: toothbrushes, toothpaste, and deodorant in a bamboo tray along with contact cases and John’s hair stuff. We love that our vanity also allows us to store a bunch of extra bath towels (picked up for just $6 each at TJ Maxx) along with a few cute decorative items like a loofah in a faux clam shell and a pretty scalloped plate with Dove soap on it for our guests (we use a bar of organic stuff in the shower, but when guests stay and want to shower/wash their face we can just mention that the soap under the sink is all theirs). 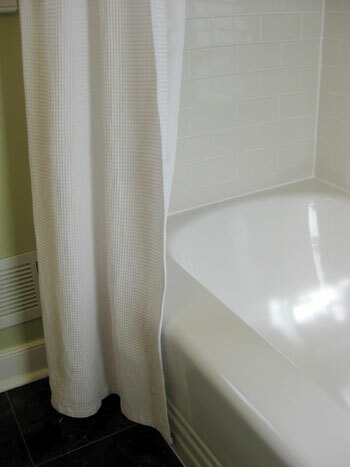 We also rehung our existing white waffle floor to ceiling shower curtain (read more about that project here) and really love that the shower tile now goes right up the ceiling to meet the bar for even more height and drama in the room. We’re so glad we spent the extra time tiling all the way up… the ceiling seriously feels over a foot taller. 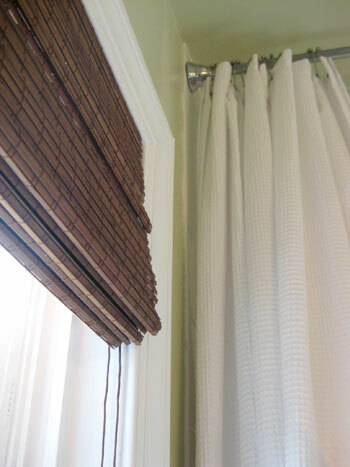 You’ll also notice that we snatched up a simple inside-mount bamboo blind from Home Depot for just $25. We love the texture and mocha color that it adds to tie in with the tones in the marble floor and even the vanity and the mirror. At the very end of our renovation we also had our tub professionally reglazed for a completely convincing like-new look. The tub was actually already reglazed when we inherited it with the house and that treatment lasted over 12 years (we received the original paperwork from the first time the job was done years ago from the last owners). And this new reglazing job should last just as long even with everyday use. The key is finding the best professionals who use the best equipment and the best formulas for a long lasting finish that looks amazing (we call for references, look them up with the Better Business Bureau, etc). As for why we opted to get ours reglazed instead of replacing it, we love the large, deep, original cast-iron tub. It was too great to send off to a landfill (and too heavy and expensive to try to remove & replace). We’re all about working with what we have, so because we couldn’t salvage the bathroom’s old tile, the least we could do was salvage the tub by refinishing it (to the tune of $399- oh and it would have only been $299 if our tub hadn’t already been reglazed for anyone out there looking for a cost estimate). Oh and because we’ve lived without putting shampoo bottles around the edge of the tub for years (since it was previously refinished and that’s not recommended) that’s not an adjustment for us at all when it comes to the newly reglazed finish. Note: we used this top rated family owned local company and are extremely pleased with their work. Here’s a shot of John’s amazing tub to ceiling subway tile. Doesn’t it look like the work of a pro? I couldn’t be more proud of my man and his first attempt at tiling! We also opted to add a simple chrome shower caddy (although we debated adding white porcelain corner shelves or even creating an enclave for shampoo and soap before we tiled) since we don’t mind the look and love that it kept our first tiling job sweet and simple. 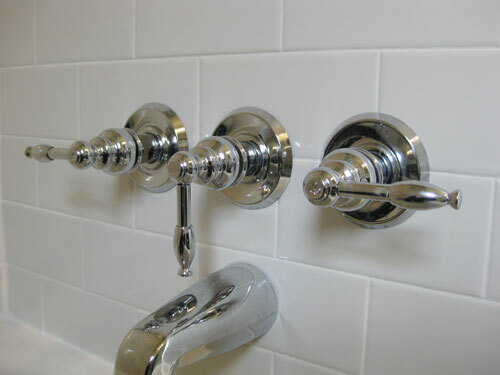 You might also notice that we replaced the shower fixtures with an insanely affordable $69 chrome set from Overstock since our old fixtures felt a bit too cottage-y with our new sink & faucet. The best part is that we Craigslisted our old fixtures (since they were only used for a few years and were in mint condition) and actually made back $30 of the $69 we spent on the new ones. Not bad, eh? Gotta love Craigslist. And on another note, how delicious does that twenty cent subway tile from Home Depot look up close? It’s so bright and shiny and clean looking- perfect for a tub surround. Mmm. Oh and this is one project where we weren’t afraid to call in the pros. We paid $100 for an hour of an expert’s time so he could remove our old fixtures (they were soldered in place behind the wall) and put in our new ones (also soldering them in place for long-lasting durability and performance). It was totally worth it to avoid any potential plumbing issues down the line and after receiving many $300+ estimates for a simple shower-hardware switcheroo we found a great local plumbing company (Advanced Plumbing – 804.358.1616) who gave us a much more reasonable price- so we’ll definitely be using them again in the future. We also have our doorless linen closet (learn about how and why we removed the door a while back) which feels even more integrated into the room since we removed the threshold and tiled the floor of the closet (which used to be wood) so the entire bathroom now has seamless mocha stone squares underfoot. The difference really is amazing! It’s like it was always meant to be an open nook instead of a disparate linen closet. 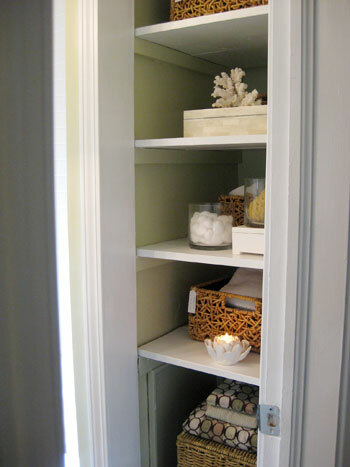 It’s a great place to store all of our extra towels, my hair dryer, my make-up bag, and other linen-closet stuff. But thanks to pretty boxes and bins (that we already had laying around) all the ugly stuff is hidden away for a clean and inviting look that’s organized and still super functional. Oh and you might notice the tags on a few of those woven baskets (which we made back in the day). They keep us even more organized and John can’t claim he doesn’t know where anything is or fail to put things back in their places- gotta love a foolproof system that costs zero dollars and zero cents. It’s the little things that really make a room feel finished. It was amazing how adding some towels and a few accessories seemed to bring the entire space from “in-progress” to “thank goodness we’re done!” And those last-minute touches only seem to emphasize and complement the more major materials like the veiny marble flooring, the crisp white trim and the soft taupey-green walls. Oh and speaking of the details, we scored our bath mat for $9 on clearance at our local West Elm (which is sadly closing its doors but that meant everything was marked down like crazy). 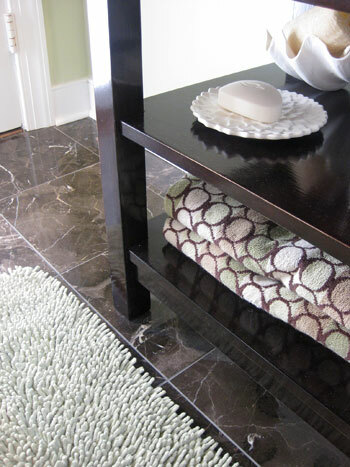 It adds so much softness to the dark stone floors and the cushy texture is so inviting for bare feet. And now for the budget breakdown. First we should mention that we got two informal bathroom estimates from contractor friends of ours (so we would have a pro price to compare to our DIY price) and both of them came in right around 10K for the entire demolition, room rebuilding, floor and shower/tub tiling and vanity installation (which they knew would be harder than a more modern redo since our 50 year old house had mortar and metal-mesh behind those walls – not to mention some old floorboard rot). * It definitely bears noting that we were fortunate enough to get to borrow some tools and a few other supplies from John’s dad (ex: the wet saw, circular saw, and miter saw). If you were to purchase these items they’d probably come in around $450 but you could also rent them for far less from places like Home Depot and True Value. Yeah we’re pretty excited about that final number. There may or may not have been some geeky high-fives being thrown around when we finally hit “=” and saw it come up on the calculator. Not only did we come in over eight thousand dollars cheaper than a professional most likely would have charged, we even came in more than 1K under our original budget. Thank goodness for clearance tile and places like Overstock, Target, and TJ Maxx for affordable accessories. And boy were we ready to have our new and improved bathroom back in action after exactly 40 days sans shower (although showering at the gym and John’s sister’s house weren’t all that bad after you got used to it). Getting supplies and installing drywall, hardibacker and new plywood floor: 42 hours (three and a half twelve hours days) Note: this step can be substantially shorter in newer homes where you’re not dealing with furring strips to build out walls to match old mortar depths, for example John’s dad tackled this step alone at his house in less than one seven hour day. The bathroom was definitely the biggest DIY projects we’ve taken on to date. 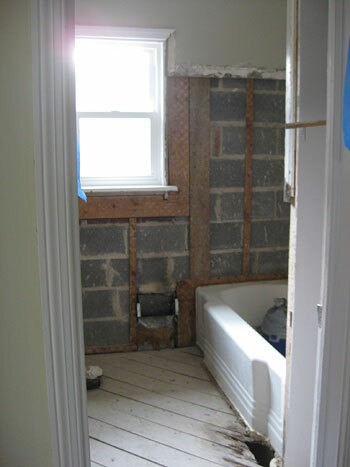 We had never demo’d tile, used a wet saw, tiled anything, or even used a miter saw before! So we love to point to our latest big makeover as proof that anyone can tackle something like this in their own home with a good amount of research and some tireless enthusiasm and determination (for more info on how to evaluate whether a project is too big to DIY, click here). 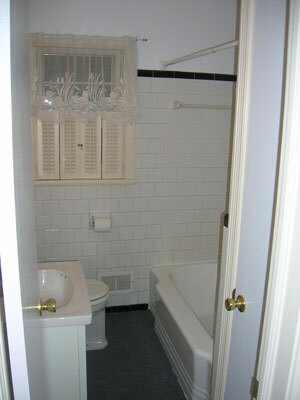 So we’ll leave you with a photo of our bathroom as it looked when we purchased our sweet old house three years ago. Can you believe the previous owners actually had gross matted carpet covering the old basketweave tile? You’ve come a long way old friend. Would we do it all over again? Heck yeah. We’re interested to see how much faster and more efficient we could be now that we’re not such newbies in so many areas of the bathroom renovation process. But would we start another bathroom remodel this weekend? That might be stretching it. While we love the pride and self-satisfaction that our big bathroom project elicited, we’d be flat out lying if we didn’t admit that it was hard work and we’re happy to take a little break from sledgehammer swinging and tile cutting for a little while. We’re not robots, ok? In fact, a nice long bath sounds about right after all that blood (some), sweat (lots) and tears (just a select few). So what do you guys think? Is there anyone out there who recently took on a similar DIY bathroom project? Any first-time tilers who are about to take the plunge? We promise it’s not nearly as scary as thinking about it. Really, once you stop dreading the whole thing and dive in it’s kind of a relief to be “doing” instead of “anticipating.” Happy renovating to one and all! 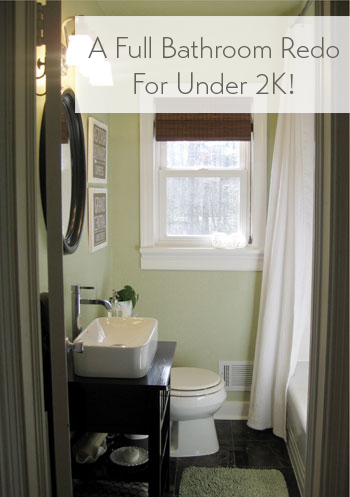 Wanna read each detailed post about the big bathroom makeover? Check out Chapter One (Planning), Chapter Two (Demo), Chapter Three (Wall Reconstruction), a little teaser post, Chapter Four (Tiling), Chapter Five (Grouting), Chapter Six (Trim) and Chapter Seven (Building The Vanity). Is the tub slick since it’s been re-glazed? If so, is there anything you can do about it? I have a very slick tub and I can’t find anything that isn’t hideous to help out! Awesome job on the bathroom, guys! I am so jealous. 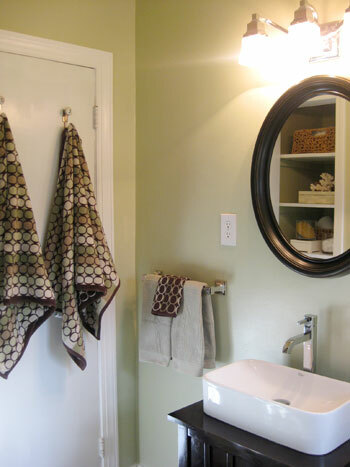 Question: I know you aren’t planning to sell your house anytime soon, so perhaps this isn’t relevant….but I know a lot of families looking to buy houses want counter space in the bathroom. 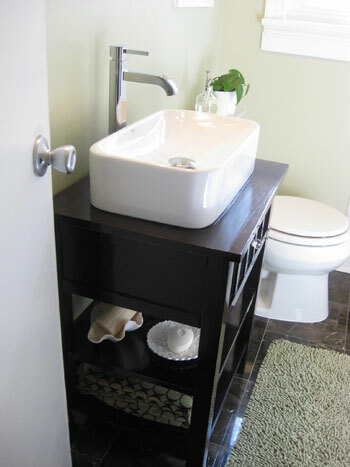 Did you consider that at all when deciding to put in a small vanity? Just curious how you guys think it might someday affect the resale value? so so so beautiful!!! i have been checking the site religiously waiting for this post, great work! have to say, our bathroom reno is in process and its going to look strikingly similar, as we also took advantage of the subway tile look, and the super affordable mocha tiles from Lowes (cut over 1,000 bucks from our original tile quote using carrera marble!) i’ll be sure to send some pics along as well… anyway, i do have one question, i cruised around your site looking for any tips or tricks on spackling and sanding the drywall seams (thats where we currently are in our process now). it just seems to take FOREVER, and never come out 100%, so if you have any guidance i would be forever indebted. Thanks! The end results are fab! And all your little touches just make it so homey and inviting. Another great job! Wonderful job you guys!! I can’t believe you did all that for under $2000! What an inspiration. We’re in the process of re-doing our half bath right now, but we don’t need to do any tiling. We’re just replacing the toilet and sink and adding paint. You guys definitely deserve a little break after all that work. But I can’t say that I’m not already excited for the first post about the baby’s room! Wow! It looks great and gotta love that price! Y’all did a wonderful job. Question: What color are the HD blinds in the bathroom? Hey Sherry and John! The bathroom looks FANTASTIC. So much work!! Way to go! Absolutely beautiful (and so inspirational)! Quick question…it looks like you guys used to have a medicine cabinet – what did you do to fill the “hole” left behind? Kelly- We just added a 2 x 4 horizontally between two of the exposed vertical wall studs and screwed a piece of drywall that we cut to the size of the opening into that 2 x 4 which was secured between the studs. Then it was just a matter of using drywall mud and tape (with a few rounds of sanding) to get everything seamless. Hope it helps! BmoreKate- We love the paint color at night, in the morning, in the evening and during a full moon! Really, it’s tied with the bedroom/kitchen color as our favorite in the entire house. It’s so subtle and muddy and not at all minty or pastel. Hope it helps! Bridget B- Hmm, the color of the HD blinds… well, we picked them up in person and don’t have the packaging anymore so we can best describe them as brown. Not that helpful right? So sorry! We do remember there were lighter, spottier ones right next to them in the store, and we opted for the more flatly colored brown ones to work with the vanity and the floor. Hope it helps! Alyssa- Our tips for spackling and sanding drywall are pretty stock: use a large flexible metal putty knife, sand the heck out of everything when it’s dry, and don’t be afraid to re-putty and re-sand a few times until everything is flat and perfect looking. Remember that paint only emphasizes dings and imperfections so never go right to painting and assume that it’ll hide any sins! AbbyW- We love to call this our forever house so resale wasn’t really a factor when we chose the sink. We do know that our new bathroom probably increased the resale value of our home by at least 5K or more, but we also know that our vanity choice was far from “safe” so it might turn some people off while it could serve as a real attraction to other buyers. Either way we’re not about to give up our new bathroom for at least a few decades. I like to picture us all old and grey on the front porch here. We’re just so in love with our house someone might (literally) have to pry it from our cold dead hands. Amanda In Boston- Those are actually old vases from Michael’s that we snagged for our backyard wedding in 2007. 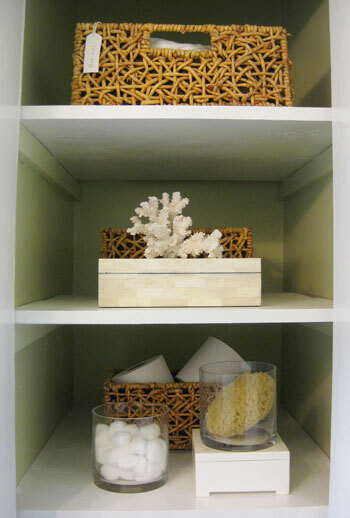 We saved a few and use them around the house (to display corks, matchbooks, etc) and now use a few of them in the bathroom as well. So cheap and so versatile! Brandi- Good question! The tub isn’t any more or less slick than it was before- it sort of feels like any porcelain or cast-iron tub would feel (a bit less flexible than a plastic tub cover but not very slick and dangerous or anything like that). Our advice for your extra slippery tub would be to check out places like Bed Bath & Beyond for chic little wooden anti-slip mats that you can put down in your tub to cut down on the slip-factor. Hope it helps! Gorgeous bathroom!!! You guys did a fabulous job! I can’t wait to see what you guys come up with for the nursery! What a beautiful bathroom! It looks AMAZING! we’re about to tackle our own pre-baby bathroom remodel. thanks for the inspiration, guys! it turned out gorgeous!!! Looks AMAZING! Great work you guys. John & Sherry, your bathroom looks amazing! I couldn’t wait to see how it turned out. You have inspired me to not give up on our bathroom remodel. My husband and I are trying to DIY with the help of a friend, and it has been a looooong process. Coincidentally, we have almost the same layout as yours (check my blog for photos http://sohldesign.blogspot.com/2010/01/bathroom-to-be.html) I like the subway tiles you used so much, that I think we are going to do the same. Thank you for providing such valuable step-by-step info and sharing your process with us. You two deserve a lot of credit! I can’t wait until I have “after” photos to share too. Any additional tips for us as we are about to embark on hanging drywall and laying tile for the first time? Our tip would just be to have confidence! Sure things will go wrong and projects will take twice as long as you think, but when the dust clears and you’re standing in your new bathroom it’ll totally be worth it! Good luck! Stunning! You did a wonderful job! Did you mention lighting in your breakdown (or did I miss it)? I see that you have a vanity light, did you do anything on the ceiling? That light above the vanity was actually our existing light before the makeover, so we didn’t have to purchase any additional lighting (there’s nothing on the ceiling but a vent fan- thanks to the vanity lights and window it’s plenty bright in there)! You guys have to be SO proud!!! This looks amazing!!!!! Now you can take a breather…until the baby comes that is!!! Great job! It looks stunning. And I was amazed at your small budget. It’s given me hope! This might be my favorite thing you have shown us! You guys raise the bar for DIYers. *gasp* I can’t believe how wonderful this looks. If I were you, I’d be pulling random strangers off the street to come in and look at it. Is there anything you guys can’t do? I have to confess I was not feeling the paint color at all during the storyline but now it just looks so great. I should have known! You definitely deserve a break after all the work – maybe a little getaway if you can bear to leave that beautiful biffy for a few days! It turned out absolutely beautiful! You guys did such a great job. SWOON. I have to be honest, I wasn’t so sure about that dark flooring, but it looks sooo good now that everything is in place. And the budget? Amazing. You’re both totally inspiring. Looks sooooo good! I love love love that sink! We redid our hall bath out of necessity (our 50 year old pipes had trees growing into them) and also replaced everything in the room except for the tub. We got our crema marfil marble tiles at a MAJOR discount too. It was only $2 per tile from a friend who does flooring, instead of the outrageous retail price of $20 each. Borrowed a wet saw, rented a jack hammer, used old Mardi Gras plastic cups to scoop up what seemed like 100 lbs of dirt and rocks and everything else was bought from the clearence/damaged pile at Home Depot. I think our total came out to about $3200 but alot of that was from the new plumbing. 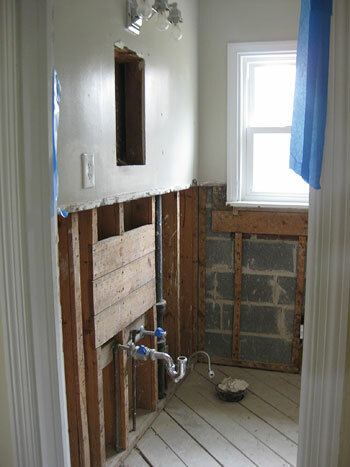 Now we’re in the process of redoing our master bath… which is 5 feet by 8 feet. I mean seriously, who the heck makes a master bath 5×8?!?!?!? Lord, give me strength. Oh, and we found crazy things hidden behind the walls: a gold ring (stones missing) a vintage wooden ruler, a few pictures of some tacky 80’s wedding, and a prayer written in Spanish by a little kid. I have them all saved in a little “this is what we found when we tore our house apart” box. Did y’all find anything? This looks awesome you guys! In the little pic’s we’ve seen along the way I wasn’t too sure about the paint color but once again you nailed it! The back-of-door hooks have worked well for us (we’re daily shower-ers and our towels are never wet the next day when we use them). One secret might be that we always run the ceiling vent fan while we shower and for a few minutes afterwards so our bathroom is well ventilated to fight any moisture build-up. Hope it helps! that looks amazing! 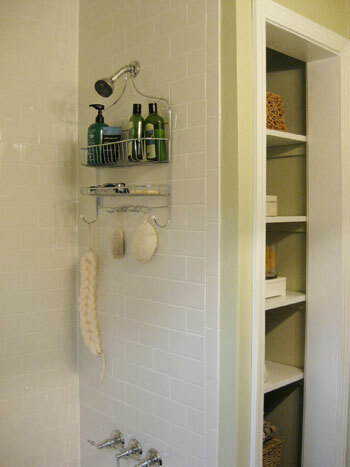 i really like the all-the-way-up tiling in the shower–definitely keeping that in mind for future house renovations. and did your house seriously have carpet in the bathroom?!? Please, PLEASE send John and his dad to my house!! Unbelievably beautiful!! BEAUTIFUL!! 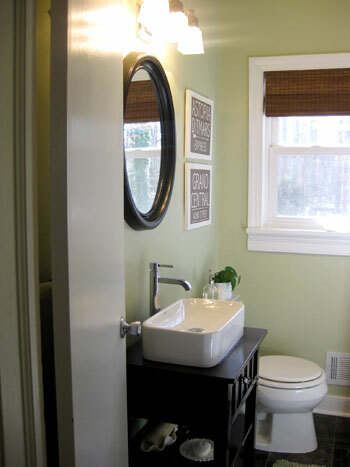 Your “new” bathroom looks amazing and it was SO affordable too!! ENJOY!! Happy Day indeed!!! You guys do AMAZING work! Love everything about it! The towels are so perfect in there too! Just wow, wow, WOW!!! Beautiful- you guys are such an inspiration! Thanks for all you do, and SHARE! You two have done it again, it looks gorgeous! I love the look of the dark vanity and mirror against the lighter walls and white tub. The white accessories throughout the room look beautiful as well. The sink is very cool and looks like it would be very convienant for giving baths to little Burgers and Beans. I’m also amazed that a bathroom this beautiful came in under budget. Enjoy relaxing in your new room! You know, in the beginning, I was a little bummed that you guys were demo-ing your vintage bath, but understood why you had to. I have to say, your new bath represents your guys style so much more! I LOVE it! Great job guys! I guess when you compare the diy quote to a professional quote you have to factor in people’s time. 123 hours is a lot of time. Really nicely done. Thanks for the budget breakdown too! IT LOOKS FANTASTIC!!!!! You guys did a great job!! I cannot imagine how great you must feel! :) I think you two should do a YHL tour! Travel all over helping other people with their DIY projects!! Just a thought. Way To Go! i’m so impressed! everything looks so professional, and you managed to come in well under budget. kudos to you both! Ok, this is nothing short of amazing. I’m talking WOW in all capital letters, bold, 100 point font. Way to go, guys! Congratulations on finishing. It looks great! New year, new bathroom! Bravo, you guys! Great transformation. Too bad they don’t have couples on the Design Star competition. You guys should have a show on HGTV! WOW, Gorgeous! I’m so jealous! I wish we knew how to tile! Can I borrow John for five weekends??? Great job. It looks really, really fantastic. 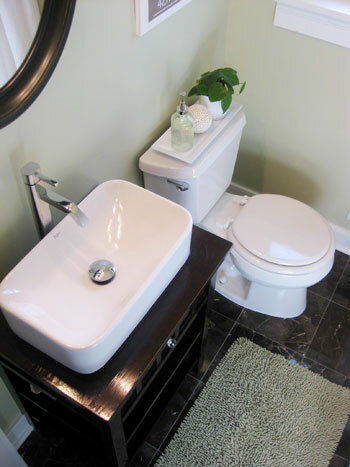 I particularly love the choice of flooring, which goes perfectly with your vanity and sink. Bravo!! PS – And your amazing budgeting definitely gives me more confidence that the folks on Design to Sell who are doing bathroom and kitchen remodels for $2k might not be lying…. what an amazing transformation. 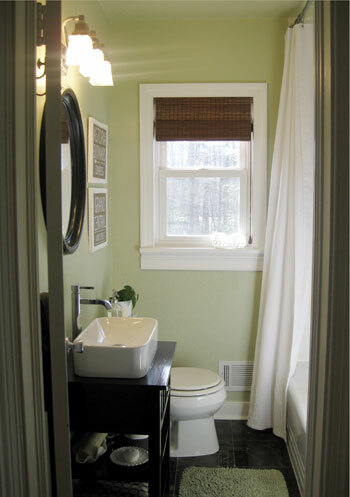 We did a slighly less ambitious remodel to our bathroom in richmond a few years ago and used A&J to reglaze the tub and wall tiles – which other than the color were in great condition. the new white tiles looked so good our friends thought we has retiled. We also found Costco to be a great source for fixtures and the vanity. Shucks Kim you’re making us blush. In full disclosure, more than a few agents have pitched shows to us, but we know they would involve weeks of nonstop taping which would make tending to the blog a complete impossibility. Not to mention now that we have a little one on the way the timing is a bit off to say the least! In short: tv sounds fun in theory but we love blogging and would never want to neglect our blog baby for the amount of time that it would take to create our own show. So for now we’ll stick to sharing our projects right here on YHL (we try to record videos every now and then too, so people can see us in almost-3D without having to forsake the blog for weeks or taping and editing). We hope that makes sense! YEAHY!!! You can finally take a normal shower at home! The remodel looks fanfrikkintastic! ENJOY! It looks so great! I’m currently tacking a mini update in our guest bathroom, which involves painting, changing all the fixtures (including faucet, lighting, and bath hardware), and updating all of the accessories. This was, of course, motivated by your amazing renovation. After a couple of frustrating missteps with paint (note: if the name of the paint chip is Zippidy Doo Da, it is guaranteed to look like a children’s theme bedroom, no matter how modern the accessories), I’m rounding the final corner. By the way, I changed our shower curtain with the floor-to-ceiling one you recommended, and it made such an incredible difference. ps: My husband and I have been following your kitchen cabinet painting tutorial (which is excellent, btw) and currently have the doors off and primed. I’ll try to remember to snap a few pics along the way to share! Congratulations! That truly looks amazing. I know my cat would want to curl up on that rug instantly. Lovely lovely job. As always I am in complete awe. I wish I was as talented as both of you! Congrats, you two! The bathroom looks great. What an inspiration! ENJOY IT!! !